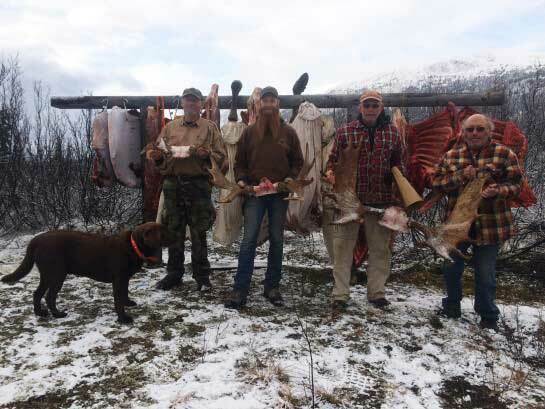 Fiberglass Moose Call • Increase your success rate! Another bull down after being lured by our moose call! The Fiberglass Moose call... a new material for an old tool. These styles of moose calls are simply megaphones; you must use your own voice to recreate the sounds of a moose to attract them, although the sounds are simple enough to mimic once you know them. Simply the most Amazing Experience I have ever had! Our moose calls are handcrafted in Canada from fiberglass and are modeled and shaped after the very successful traditional birch bark moose call. Being stronger and more resilient, our fiberglass moose calls will withstand the pounding and thrashing you'll give them. Many moose hunters like the birch bark calls (myself included) but find they lack strength, durability and resonance of the fiberglass ones. The calls are textured for ease of grip with bare hands or with gloves. 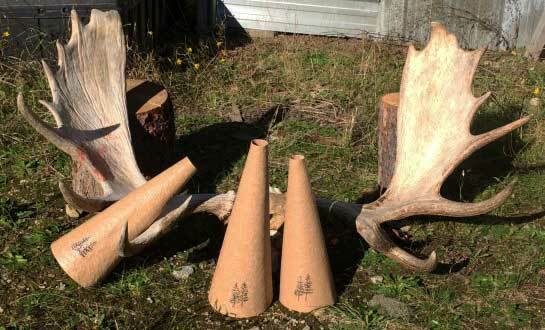 We are pleased to offer two sizes of fiberglass calls for your moose calling. Buy one today! Want success like this? Buy one of our moose calls today! Which Fiberglass Moose Call is right for you? The Guide moose call will resonate deep into the wilderness or out across the tundra. Remarkably lightweight and easy to carry, it will withstand years of use. The Long Distance - need to cover a lot of territory? Use this call to - "Reach Out". 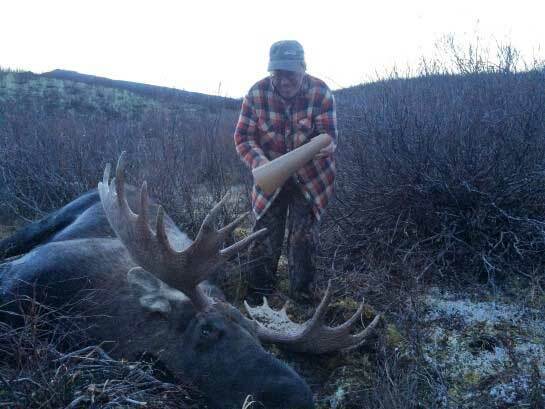 He called in this amazing bull with cow calls using our fiberglass moose call! "The bull came in just like magic!" The Guide: Our most popular call! Designed with the pro and experienced hunter in mind. Strong enough to withstand years of use, yet light enough to carry with you on every moose hunt. Call in giant bull moose for your clients or yourself! Long Distance: Our long distance moose caller. Used to reach out and lure bull moose from afar. Your moose call sounds can carry over one mile. Note: Length and weight dimensions are based on averages. You may also be interested in purchasing our book: The Ultimate Guide to Moose Hunting to go along with your moose call. We have combined the Guide Call and the Book into a bundle for you. Save 10% buy purchasing together. 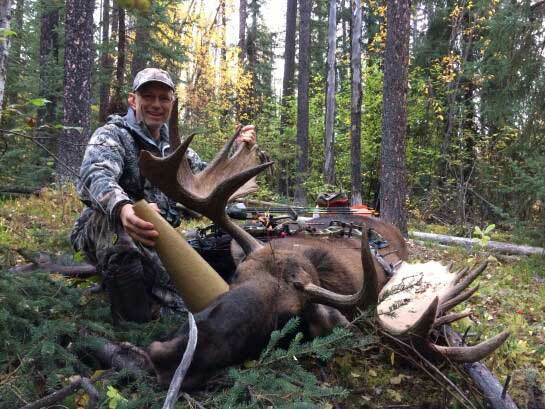 Get results like this using our fiberglass moose call! Use our calls to lure in small or large bull moose. Our calls have been proven in the field! These three moose were taken in September 2016 in the Yukon Territories, Canada. We try to ship within two business days with typical delivery times of 4 - 10 business days depending on your location. Once your payment has completed you will receive an email notification from "client@e-junkie.com; on behalf of; All About Moose" with your payment information and or download link. Why use a fiberglass moose call over a birch bark one? A couple of seasons ago just as dusk was setting in I was making my way back to my quad for my ride back to camp. As I was surveying my route I spotted a nice bull crossing the cutblock just a few hundred meters ahead of me. I quickly readied my bow and set about calling to the bull. My first cow calls were totally ignored, as were the second. I don't think his ears even rotated in my direction. He had a destination in mind and wasn't going to let a female moose deter him. Stumped, I wondered what to do. He was fast approaching the timber and would soon disappear. I tried a bull grunt! That stopped him in his tracks. However, without even looking in my direction he continued on his journey. Well, I usually don't like to get a 1000 plus pound animal angry at me, but I was desperate. I took my birch bark call and started to rake the nearest tree. The bull responded with such a roar like I have never heard. Then he wandered off! I tore a huge hole in the side of my moose call. My point is, that if I would have had a fiberglass call, I wouldn't have had to go buy a new one. Listen to a recorded moose sounds every year before you go hunting to refresh your memory as to what these animals sound like. It is a matter of practice to learn to duplicate the sounds in order to get the moose to come to you. Also consider using a moose decoy while out after moose. One more tool in your bag of tricks... they work awesome to distract moose you are calling, or get those that are hung up just out of range to come in closer. Use the call to mimic a cow moose urinating in a lake. Just fill it with water and let the liquid pour out of the small end. The sound is like magic to a bull moose. Use the call to rake or thrash a tree or bush without fear of it getting a hole in it (used within reason). Call every 10 - 15 minutes and listen very carefully. Sometimes bulls grunt quite softly, especially if there are predators about.